According to new documents recently released by Canadian government, emerging issues may include targeting the use of virtual private networks and website blocking. Bell, one of major telecom companis in Canada asked the government to ban VPN services in Canada ahead of North American Free Trade Agreement (NAFTA) negotiations. The document identifies a few issues, each likely to be exceptionally controversial. One of the issues involves the use of VPN for copyright infringing purposes. VPNs are widely used in corporate environments to ensure secure and safe communications and by a growing number of Internet users seeking technological tools to better protect their privacy online. The same technologies can be used to hide copyright infringing activity, however. Many Canadian users noticed that asking to ban legal technologies because they can be used illegally is ridiculous! Good news that there is still a solution how to avoid VPN blocking by ISP. Usually, ISPs are blocking the ports that are used by common VPN tunneling protocols, such as OpenVPN. Some powerful VPN providers are able to overcome the blocks. 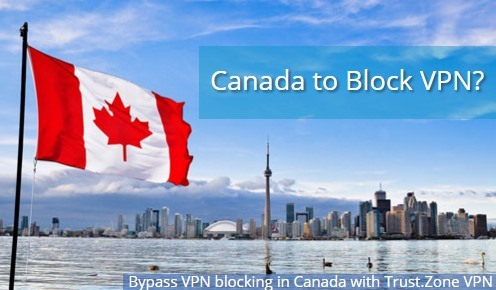 Trust.Zone VPN service can't be completely blocked by ISP in Canada because Trust.Zone VPN service may forward the encrypted internet traffic via HTTP Port 80, HTTPS Port 443 and DNS Port 53 which are never blocked by ISP. If VPN is set to work on port 443 than your ISP is able to see something that looks like you are browsing a website with HTTPS like Gmail, PayPal and other. This means all your ISP and tracking services can see how much traffic you use, not what you are using it for. The latest Trust.Zone Payment Processing System stats revealed that there is boost 250% in payments made by Canadians last month.